[Discontinued] Over the last few months, I have repeatedly planned to make this a Friday Night Fight or even a Saturday Night Showdown, but the stars just refused to align. Unfortunately, as was the case many times during 2012, I've waited too long and one of the opponents suffered the sad fate of passing his best by date. 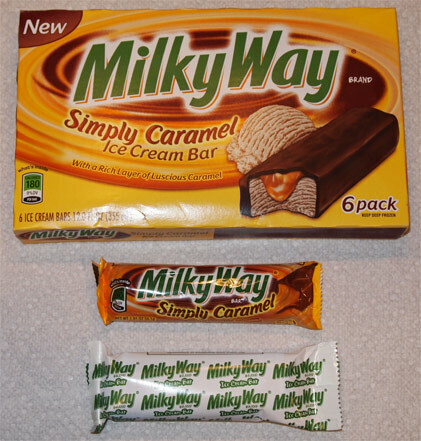 No, it's not the Milky Way Simply Caramel Ice Cream Bar that has gone rogue, it's still good for several more months. No, it's actually the Milky Way Simply Caramel Bar that has gone stale. 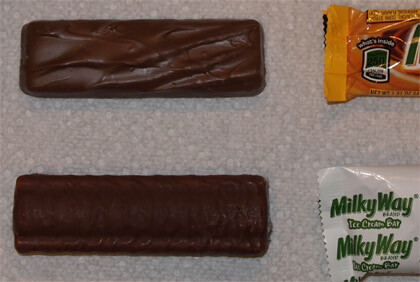 I guess they don't make candy bars like they use to. 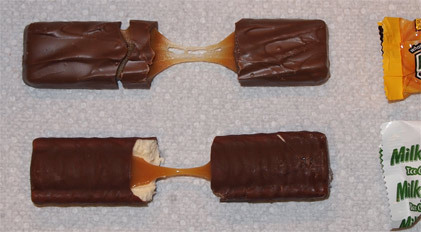 What I can tell you is that when I first tried the simply caramel ice cream bar, I was a little put off. The caramel sauce mixed with the caramel ice cream was a little much for me. Granted it was early in the day and maybe I was a little parched to start, but it came across as really dry. The good news is that as I had more of these, the "dryness" became less apparent. Now from a visual perspective, I've going to take the ice cream bar over the regular bar any day. 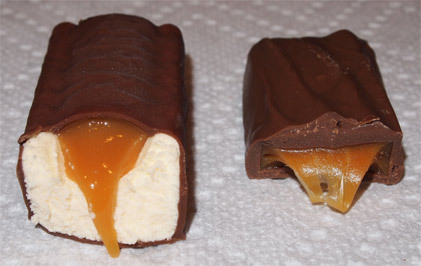 I like caramel, but I love ice cream, so the ice cream bar wins. With that in mind, I was all ready to end this review by saying "well, the simply caramel bar mixes things up a little, but the original is better".... but then my wife comes over with "I think this one is better than the original". Doh! We do not have consensus folks! Now I'm not about to argue that they aren't both tasty, but better? Iunno. I guess Mars made the right decision making two versions because now everyone is appeased.